So I was tagged by the lovely beauty blogger Sofia from the blog Beauty In Crisis to do this 5 product make up tag, so if I had to do my make up with only 5 products which products I'd use. 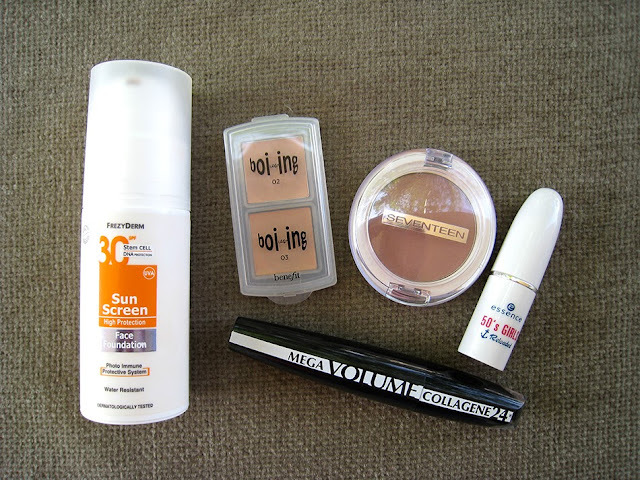 Because it's summertime and we all get a bit lazy with our make up routine,it was easy for me to choose only 5 products, let's take a look at the ones I used and enjoyed the most! It's very important for me to use some kind of base on my face, whether it's a liquid foundation or just a powder, my absolute HG face product for this summer was definitely the Frezyderm Face Foundation SPF30, which is a foundation and a sunscreen in one. It gives an amazing coverage and also protects my face from the sun. A concealer is also very important to me, actually it's even more than a foundation, because if I have a good skin day I just pop some concealer on my face a little bit of powder and I'm done. I chose the Benefit Boi-ing concealer and not one of the others I have in my make up collection because it provides amazing coverage for my face and not just for under my eyes, it's propably the only concealer that covers so well my imperfections such as redness, spots and scars, so if I had to chose only one concealer it had to be this one! A bronzer it's an essential whether it's winter or summer, and because I had to choose only 5 products for this tag I decided to skip the peachy blush and just go for a brown blush that can be used as a bronzer. My HG is Seventeen's Cafe Au Lait blusher, it gives to my face the warmth it needs so I won't look like a ghost. As for my eyes I decided to choose just a mascara, because I can go without eyeshadow and liner with no problem, I have hooded eyes and my lids have a natural brown tint so most of the times I look like I wear brown eyeshadow without even wearing one! The mascara I love the most is L'oreal's Mega Volume Collagene 24H, it makes my poor thin lashes look fuller. And lastly for my lips it was really hard for me to choose only one lip product, but I'm 100% sure that the Essence I'm Sailing lipstick is the one that I loved the most this summer. 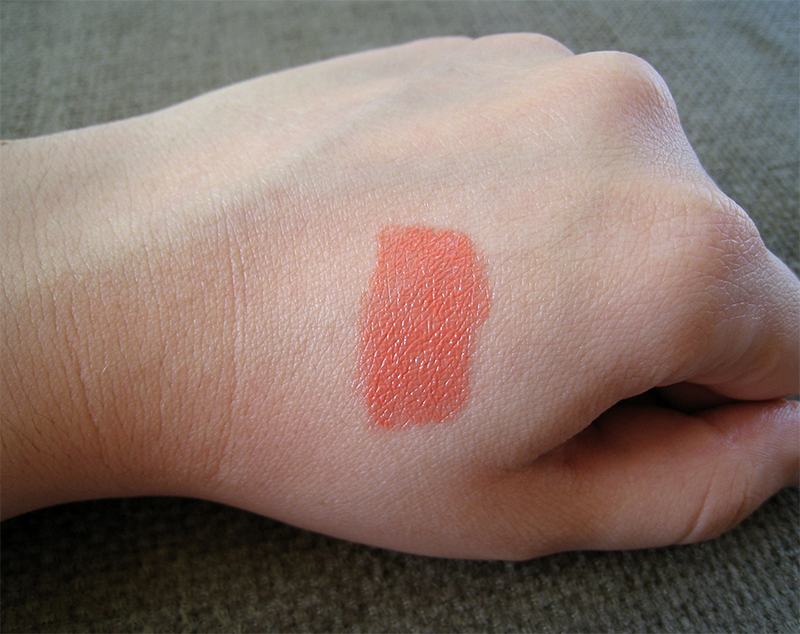 It's peachy, quite pigmented and with a glossy finish, what more could I ask? Whenever I use this lipstick I look like I have a tan when I actually don't have one. I hope you liked this tag post, I know that you've already seen most of these products in my previous posts but these are the ones that I love and use the most right now, and definitely the only ones I would use on a daily basis. Since I'm propably the last person to do this tag, I want to tag every single one of you to do this post if you haven't already done it, and for those who don't have a blog I want you to leave me a comment with the 5 products you would choose to do your make up. omg this lipstick looks amazing! !have to check and do the tag as well!! lovely post hun as always!! Ειναι τελειο, Ι want more!! Ok, I want this lipstick. Χμμμ... Μάλλον πως πρέπει να το κάνω κι εγώ αυτό το tag! Πολύ ωραία όσα διάλξες και πρέπει να σου πω ότι πολύ μ' έχεις ιντριγκάρει για το προϊόν της Frezyderm! Το ρουζάκι θα το τσεκάρω σίγουρα γιατί έχω μείνει πολύ ευχαριστημένη απ'ό,τι έχω δοκιμάσει και θα δω και τη συγκεκριμένη απόχρωση. Καλά η Frazyderm δεν το συζητώ, έχει μπει στη λίστα για του χρόνου ήδη! !